The Albany Bicycle Coalition unequivocally supports the Madison Ave. Road Diet application for the Transportation Enhancements Program. This will allow for restriping, traffic light retiming, paving, and constructing cycling and walking enhancements. 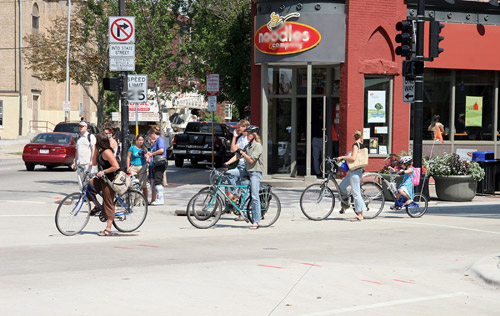 The Madison Ave. Road Diet consistently has had strong community interest. With completion of the feasibility study and with appropriate funding, the City and the community are prepared to move forward with a new, calmed Madison Ave. The City of Albany completed a Bicycle Master Plan in December 2009. It identified Madison Ave. as a “Major Bikeway” needing infrastructure improvements for all bicycle riders. With its current configuration of two travel lanes in each direction, the existing roadway simply cannot function as a major bikeway. The proponents of the plan believe a road diet will have multiple advantages, included but not limited to increased safety for all, more efficient traffic flow, improved access between uptown and downtown, and reduction in emissions from motorized vehicles. We strongly support the Madison Ave. Road Diet application for the Transportation Enhancements Program to assist with the restriping, light retiming, paving, and bicycle and pedestrian enhancements.